Looking on my map, I realized that this would be one of the hard days. I had to do 32 kilometers and, for me, that’s a hike. This day would be unimaginative and tedious. A nice way to say boring. But my saints always jumble things up for me. 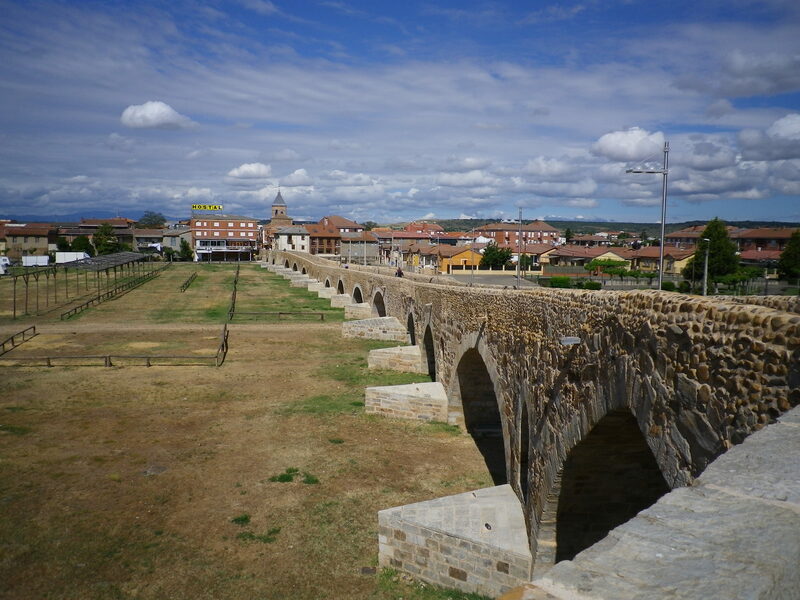 More than 17 kilometers into the day, I crossed one of the most impressive medieval bridges on the Camino, the Puente de Orbigo. It is the site of a wonderful chivalric legend. 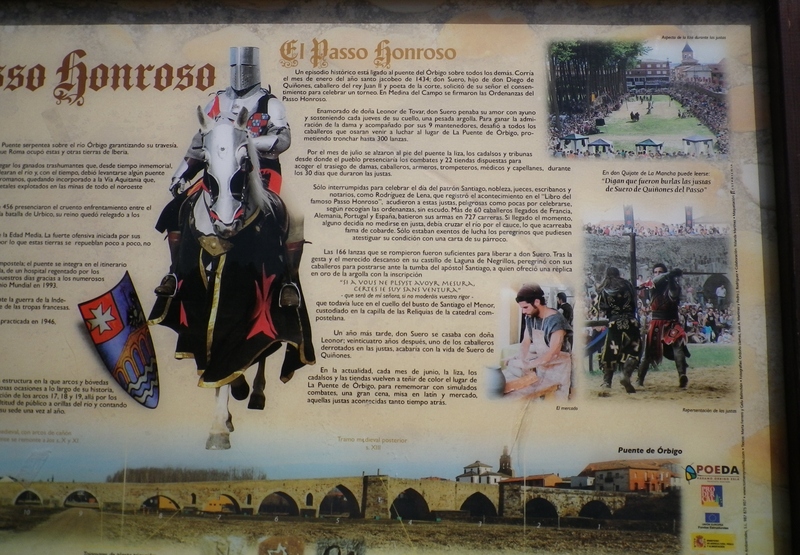 A knight, Don Suero de Quinones, was scorned by his lady love. In despair, he vowed to challenge all who dared cross this bridge. Knights came from all over Europe to accept his challenge but he defeated them all. He broke 300 lances of 300 challengers, which was his goal. His mission accomplished, he went to Santiago de Campostella to give thanks to St. James for helping him forget his broken heart. None of those ideas crossed my mind. There was no good reason to stop. Outside the town of Santibanez de Valdeiglesia I met him. A nice old man, standing in front of the doors to his garage. He stopped me on the street. He waved and spoke to me in Spanish. There was no one else around either in town or walking the Camino. I was at a loss as to what he wanted. Then I realized he wanted me to go into his house. What a weird situation. The personal safety factor had long since left my mind on the Camino. I was safe. My things were safe. No one got hurt on the Camino. Well, if they did, there were people around within minutes to help. 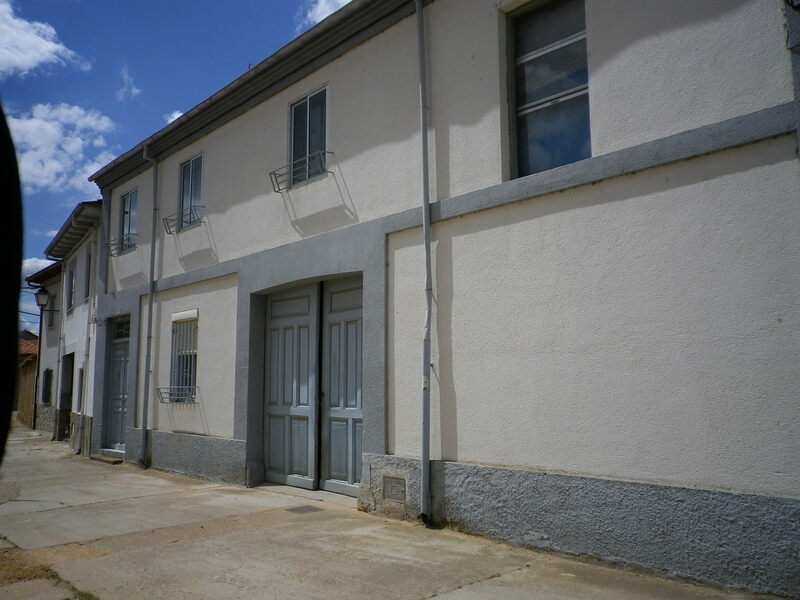 It was time for me to decide whether to trust all that had happened on the Camino so far or to put my street smarts into action. Number one city rule, Never Talk To Strangers. 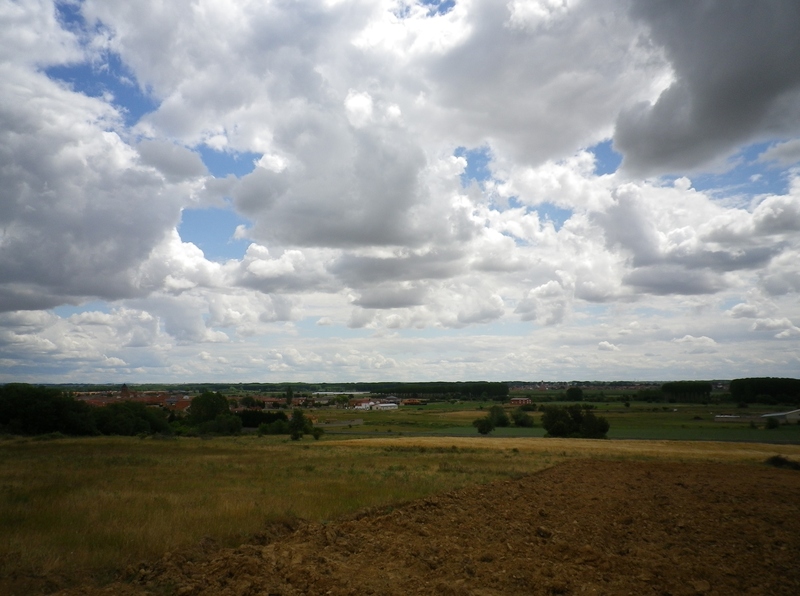 But everyone on the Camino had been a stranger and I had had nothing but good experiences. I could only rely on my common sense and intuition. I looked him over carefully. He seemed harmless. His eyes seemed normal and friendly with no hint of crazy. What were the chances that Mr. Weirdo would be waiting on the Camino, ready to pounce on unsuspecting pilgrims as they walked along? The dog at his feet waved his tail in a friendly manner. I checked out how I was feeling. I was taller than him by about half a head. I had two sharp hiking poles in my hand. He was older than me and he walked slightly hunched. I warily walked through the garage doors, looking around carefully. No one lurking behind the doors. Just the sound of the breeze through the trees. I held my poles firmly and followed him into his back yard, his dog walking between us. There in the yard was a cherry tree. The man spoke to me in Spanish and the story began to make sense. It was cherry season in this part of Spain and the trees all along the Camino were fully loaded. This cherry tree was no exception. Rich, ripe cherries hung heavily down, like thousands of dark red waterfalls, reaching to the ground. “Roof,” the dog, loved cherries. He was eating all the cherries he could get his mouth around. All day, every day. Also, the birds took all the fruits from high in the tree. So the gentleman had dogs and birds eating all the cherries on his lovely tree. He could make a cherry pie every day during the season and still not use all the cherries on this tree. So he invited pilgrims to take all the cherries they wanted, as many as they could carry, from his tree. We struck up a conversation as best we could – my bad Spanish and his non-existent English. But his smile was friendly and he was sincere as I watched his dog eat from the tree. I picked cherries from the tree. I put out my hand and the ones that were not over ripe became my property. I didn’t have a bag or a basket, of course. Where did I put them? In every pocket I had. My pants, my raincoat, my shirt. I thought carefully of the effect smushed cherries would have on my clothing but there was no way I could decline this offer to pick unlimited cherries. He showed me the antiques in his barn. I know old junk when I see it but I nodded and smiled, impressed with his collection of . . . um . . . stuff. He showed me a large spiral notebook he had on the table near the tree. At first I didn’t know what I was reading. But slowly I realized what the handwritten messages in the book were. This notebook was an album, going back years, of messages of thanks from pilgrims who had visited this back yard like I had. There were thank you notes from people from all over the world. Alaska, Japan, Australia, Germany, South Africa. In all languages, thanking this man for his generosity. 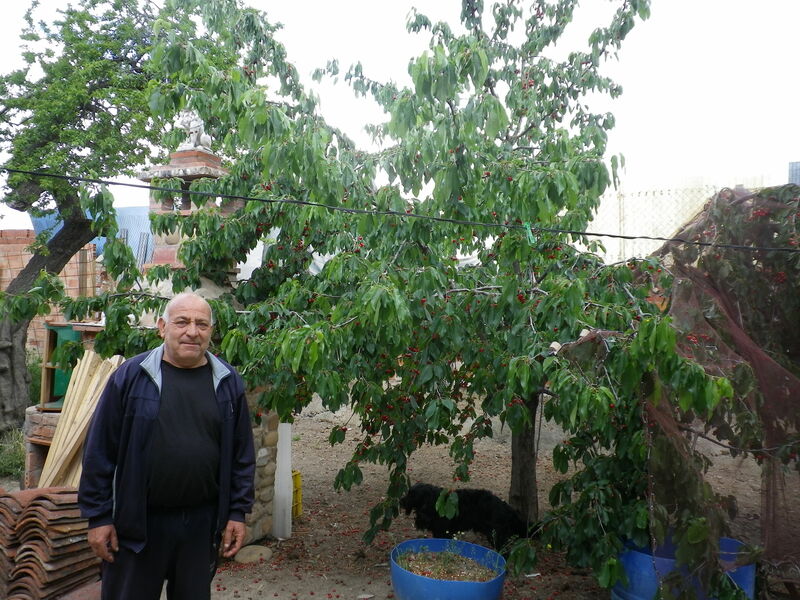 He told me that, when the cherry tree is not in fruit, he offers cold drinks and cookies to the pilgrims. He does this as often as he can. He has a car but doesn’t drive it any longer so he has a neighbor or one of his children drive him into town occasionally. The pilgrims who pass by his house every day have become a source of delight. He has met people from all over the world this way. His album is a reminder of – what? That he still has a positive impact on the world? That his life still matters to people he doesn’t even know? That kindness is still appreciated and rewarded? That his world can be bigger than just his dog and the birds? I had been lost in thought on how many more kilometers I had to go, how boring the walk was and how tired I was. Then, this old man stopped me with his words and hand motions to follow him through the doors. An hour earlier, I had faced a dilemma – listen to my street smarts or my saints. The saintly voice in my head had reminded me of my decision to not refuse anything I was offered on the Camino. It had told me that I was strong and confident and could get myself out of any danger. It had told me to let my guard down and that I was always being watched over and was safe. I signed his book and thanked him. I gave Roof a hug and a good rub all over. The man brought out a package of cookies and I took two. They were giant and sugary. We walked back through his garage and I thanked him again for his kindness. Did he have any idea how inappropriate it was to invite strangers into his house? Did he think that pilgrims who refused were being rude? In another place and time, he would be visited by the local police. They would make him stop this crazy, quixotic mission. And then his world would become a little smaller. 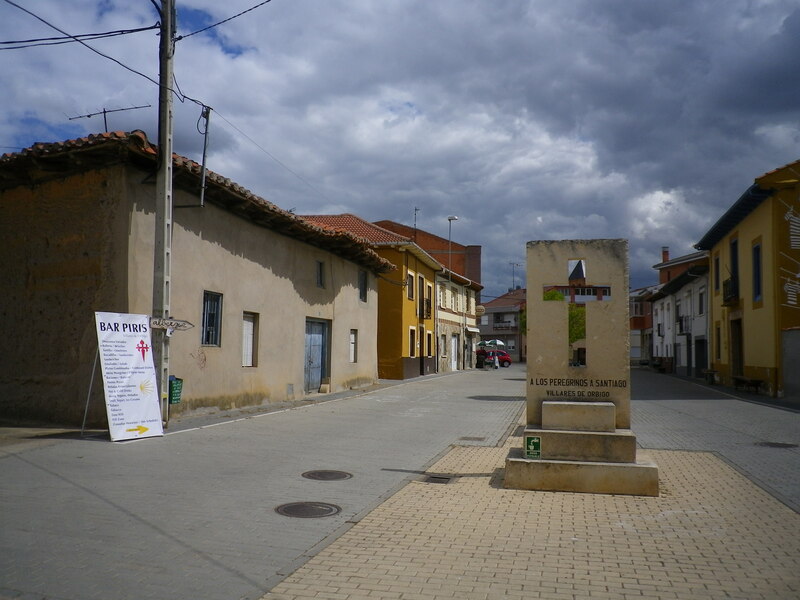 This entry was posted in camino de santiago de campostella, Saints, Spain, Travel and tagged Camino de Santiago de Campostella, hiking, Spain, women hikers over age 60, women hiking solo. Bookmark the permalink.